A SMT SERVICES Operational Service contract allows you to get the best out of your system. The Preventive Maintenance Service is the basic service of this package. Your equipment will be regularly inspected and maintained by qualified SMT SERVICES personnel, leading to an improvement in your system’s quality and reliability. If customers need more support, we can easily adapt to it. The Operational Services makes life easier for you. Preventive Maintenance with Calibration: Regular, professional maintenance lengthens machine lifetime and optimizes equipment performance. Includes discount on after sales orders for services. Telephone Support Service: Enables most of all service and process related issues to be diagnosed remotely via telephone. Corrective Breakdown Service: You will have a guarantee maximum spare part availability and quick response by highly skilled personnel in the event of emergency machine breakdown. Response Time Option: This is an additional option of the CBS and gives you a guaranteed response time by a field service engineer with parts and tools after machine breakdown. Software Service: Providing you with the latest software version, including a helpdesk service during office hours. 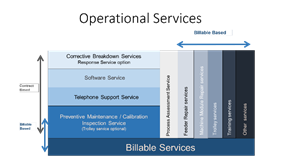 The Operational Service program from SMT SERVICES brings two major advantages. You get top-quality service, and your personnel is free to concentrate on their own work. Regular inspection and maintenance of your equipment greatly increases the chance that it will perform better, last longer, and suffer fewer breakdowns. The cost of Preventive Maintenance is calculated per machine and based on the amount of shifts you operate. Increased productivity and improved performance quickly recoup the cost of this service. Optional on the Preventive Maintenance Service you can choose for extra services as mentioned. Your SMT SERVICES call center will take care of all the necessary actions with respect to your request for Installation Services.